Hold onto your hats Instagram fans, the camera you’ve been waiting for now has a price tag. Socialmatic, the company, recently posted a photo to its Facebook page detailing the specs and cost of its upcoming retro digital camera. 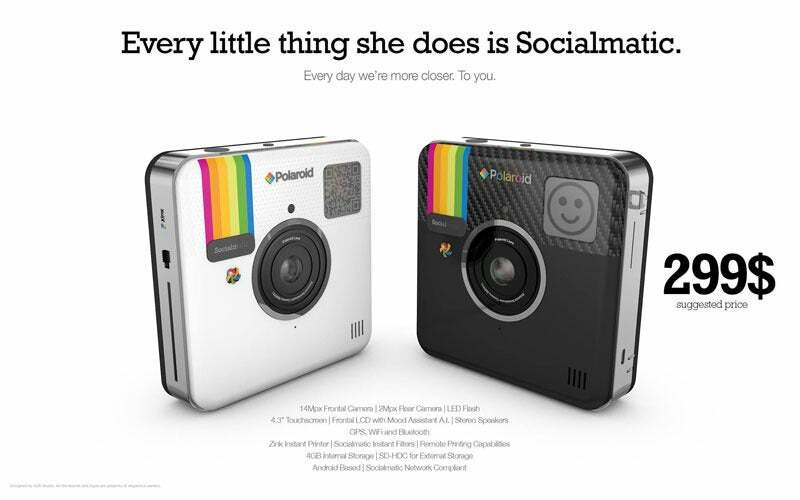 The Socialmatic camera will cost $300 and begins shipping in early 2014. If you’ve never heard of it, Socialmatic is a slim, Polaroid-branded digital camera with a built-in printer and onboard photo-filter software. Socialmatic pics can be printed or uploaded to Facebook, Instagram, and Twitter. You can also send photos to friends via email and MMS, and the company will also offer its own social network for the camera’s users. Socialmatic didn’t say exactly when the camera would be available, but the company did say in response to a Facebook user comment that it would start taking pre-orders soon. It’s not clear if the specs will change before the camera ships, but right now the camera will feature a 14-megapixel front-facing sensor and a 2-megapixel rear-camera for selfies. For storage, you get 4GB onboard as well as an SD-HDC expansion slot. (There’s no word on the maximum card size the camera will support.) The Socialmatic camera also comes with a 4.3-inch touchscreen, LED flash, stereo speakers, Wi-Fi, Bluetooth, GPS, and a Zink instant printer for making physical Polaroid printouts. The camera will run a version of Android, but it’s not clear which flavor of Google’s mobile OS will be used. It’s also unknown if the Socialmatic camera will have full access to the Google Play Store or what kind of RAM and processing capabilities the device will offer. Although Socialmatic offers Polaroid-style printing capabilities, the new camera adds a digital twist, as each photo can be printed with a comment and will have its own QR code. Other Socialmatic fans can snap the QR code to start following you on the Socialmatic social network. Each photo will come with an adhesive backing so you can paper the world with your gratuitous shots of dinner, skyline views, and house pets. Socialmatic started out as a concept created by Italy-based ADR Studios in 2012, but quickly morphed into a commercial project, gaining funding and enthusiastic interest from users worldwide. Interest is one thing; laying down $300 for a digital camera when you can get smartphones with imaging sensors anywhere from 8- to 41-megapixels is something else. It will be interesting to see just how well Socialmatic fares when it finally becomes available for pre-order.